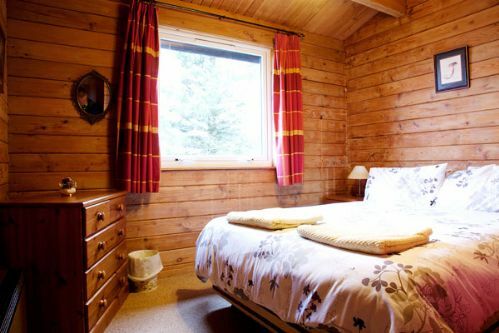 Strathconan is a cosy wooden chalet, set high on the hillside above Kilchoan, with far reaching views over the sea to the Isle of Mull and Morvern. It is an ideal base for exploring the Ardnamurchan with it's many sandy beaches, including the stunning Sanna Bay. The Kilchoan Hotel, Ferry Stores, Kilchoan Community Centre, Playpark are just a short walk from the house. There are regular ferry sailings over to Tobermory from Kilchoan. Had a lovely short break in Kilchoan Ardnamurchan, part of the workforce building a new house on the hill. The property ticked all the boxes. It is in a small community, warm and cosy with amazing views. If you like quiet and beautiful surroundings this is the place for you. Adequate. The shop needs an uplift and the hotel did not look inviting. We were impressed by the community centre. We had a great time in Ardnamurchan. It is one of the unspoilt areas of Scotland. 4 adults stayed in this accommodation. It smelt fusty due to not being used. the twin room had urine stained mattress which should have been picked up on cleaning. The double bed head board is made of material and you can see where peoples heads have build up stains over time and needs replaced. The cabin had not been aired properly and smelt badly. The shower wasn't sealed properly which could have something to do with the fusty smell. The couches and mattresses need replaced. The heating was the old style over night heaters which are not easy to control, although there was an electric heater if we needed a boost and kept us warm. The cabin is generally warm and well insulated. It is fairly well equiped with lots of quilts, although these were tainted with the fusty smell. It was a good job though that we brought our own bedding, duvets and towels. In the kitchen area the fridge door needs to be reversed as accessing it was not easy. Outside the cabin has no defined path and the grass (very long and uneven) and path/driveway leading up to the cabin was slippy due to the weather (natural enough in Scotland) was treacherous, one of our party slipped and fell. We did complain and received a £40 refund of our nearly £300 fee (for 4 nights). The cabin is warm and ideally situated being elevated with great views but is desperately in need of some TLC to bring it up to standard expected by visitors. the shop and hotel are good. Our stay was very peasant, we loved the area and the cottage ! We will recommend Steading holidays . Third holiday in this house - need I say more? I have been visiting Kilchoan for many years and this is the third time I have stayed in this property. It is comfortable and has a good outlook both front and back. The house is much nicer inside than it looks from the outside photos with a bright open plan living/dining/kitchen. The porch provides good shelter for bikes. The village shop has just changed hands. Due to the location food and papers are delivered during the day so factor that into your day. Fuel is extortionate again due to location - diesel was £1.46 a litre when I visited. Unfortunately the Sonachan Hotel has closed so there is less opportunity to eat out. Phone signal seems to have deteriorated since last year so don't rely on it to access the intenet. You don't go to Kilchoan for the facilities but for the scenery and outdoor activities. We enjoyed Western Scotland this summer. The cottage was in the center of beautiful area that we wanted to explore. Short trips to Mull and north beaches of Ardamurchan. Nice hill walks and really good people. It was fun visiting Tobermory without having to stay there. Very nice cottage with everything one could want (except WIFI but that was just down the road). Jacqie and John in the Steadings office were very helpful. We did not have a car but walking to the ferry was OK and Nan up the road offers a taxi service and took us to Sanna Bay. Shop and pub OK for basic supplies and food. Rather too many cars making walking along Kilchoan's single track road slightly uncomfortable. Tobermory on Mull easy to get to and has everything. A lovely cabin set in beautiful surroundings. Clean & comfortable - shower is great - living room/kitchen spacious. Been coming to Kilchoan /Sanna for many years. Was introducing a friend to this amazing part of Scotland. Strathconnon is comfortable and familiar and is an excellent home to which to retreat for quiet to do some work. Ok place in a great spot. Could be really great with a little bit more effort. Generally a good place and good, unintrusive customer service. Cleanliness generally ok but let's itself down in some key areas, e.g. dirty floor beside the fridge, cobwebs in the bathroom, kitchen vinyl scunchec up by the washing machine. Strange selection of crockery and pans, lots of egg cups (!) but a good sharp knife. Mixed message about electricity. Bill stated clearly and correctly the electricity was included but instructions in the property tell you otherwise. Made us feel insecure. There was no need for that. View from the cabine is great - unfortunately, the view west is blocked by two large, out of place leylandii. Overall an OK place in a good location, which has seen better days, but which - with a bit of TLC - could easily be great. I would recommend it, but only to people who I know appreciate the location enough to put up with the basic standard and a bit of dirt. The booking service was excellent - only the information on the web was inaccurate. The place we found marked as free was actually occupied, while the place that was free was not on the web. Good job we didn't book on line but called first. We were there for the outdoors, the beaches, the hills - and they were great! Sanna in particular. Shame only about the many hostile notices by the local crafting committee. 'No camping, no overnight parking, dogs worrying sheep may be shot(!)'. We didn't want to camp, or park over night and have no dogs, but it is still very off putting and makes for an unfriendly welcome to the area. Peaceful and all round excellent. On-site Craft & Gift Shop most attractive. Ferry to Tobermory a good day trip. Just back from our latest week at Strathconon. Although the weather was not at its best we had a relaxing week in a well equipped and comfortable chalet. Even on wet days there are always plenty of books to read and jigsaws to complete (and you can always switch on the TV if absolutely necessary. We know the views are stunning although we couldn't always see them this time - did spot the ferry on its way to the Outer Hebrides a couple of times! Cooking facilities are fine for a holiday and there are a few eating places nearby for meals out. Plenty of places to visit within driving distance and lots of interesting walks within a short drive. Hotels very good, local shop a bit limited in supplies at times. Local community garden good for fresh veg. This is the second time I have stayed in this property. 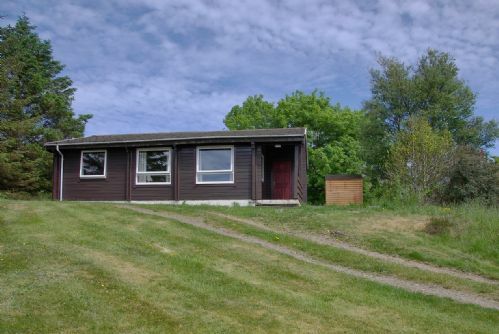 The outside picture does not do it justice as the chalet is much brighter and more ccmfortable than the photograph suggests. There is an open plan living, dining and kitchen area with two windows to the back, one to the side and two to the front. There is also a huge mirror on the fourth wall. The property has a good open outlook but like a number of the properties on the old golf course the view is reducing gradually due to the growth of surrounding trees. I am old enough to remember when this was a golf course and the hillside was open. There are sections where trees are growing unfettered which is gradually closing in the views. The double bed was firm and very comfortable. My guest said the single was soft and comfortable and she easily found extra avers which she needed.. The kitchen is well equipped though I would have liked a bread knife and more cupboard space for food. There was an issue with bulbs blowing in the bathroom which was repaired very promptly. We thoroughly enjoyed our week at Strathconnan. 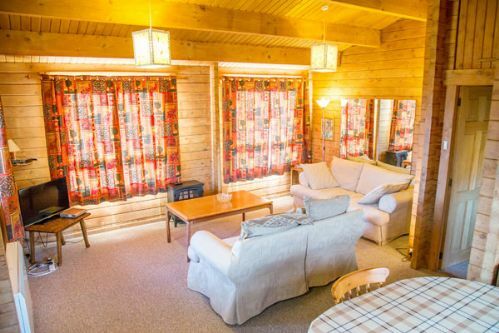 A very comfortable lodge , with many home comforts. We know Ardnamurchan reasonably well & enjoyed visiting Sanna Bay and taking the ferry to Mull. It's a long drive to Kilchoan from almost anywhere , but worth it every time. Very cozy. House was very well equipped and very comfortable. Views from windows was amazing. Lovely to sit on the front lawn in the sun and just relax in the peace and quiet. Will defiantly want to come back to this wee house again. We all loved our stay at Strathconan. The lodge was very homely and cosy with amazing views. The kitchen was well equipped. We were all sad to leave. No - they might want to go with us! There was only one shop (we wanted rural so this was not a problem). I would recommend doing a food shop at a supermarket en-route. My friends and I quite enjoyed our stay at Strathconan! The cabin has excellent views and was well-situated for travel to other places on Ardnamurchan, down to Mull, and even not too far of a drive to get the ferry to Skye. We were rather cold, but I believe there are plans to update the heating which will be a good addition to the cabin. The TV was also much appreciated for the long evenings of winter. This property was well below the standard we expected. Soft furnishings, carpets and beds past sell by date. Water leak of long standing under sink in bathroom also heater out of order. Back bedroom damp which caused 82 year old chest problems had to attend GP for steroids when returned home. Other problems to many to list here. Tried to make best of week but not a pleasant experience. Ferry to Tobermory a good option. Spacious very well designed and equipped accommodation with good ambience. We did not need to use any heaters but plenty were available if needed. Excellent TV reception but need to go to the nearby craft shop to get WiFi. Access by car a little tricky because of the 50 yard grassy slope but able to park very close to the door. Best to reverse the car back down and this is OK after the first time. Nice patio with covered area and the vestibule was particularly useful as we had a dog. The cost of the Chalet was the main thing that attracted us to the site, it was much less then comparable accommodation else where. Found the location easily, entrance next main road. The chalet was well equipped with a lovely view over to Mull. Some of the chalet fabric looked a bit tired and could probably do with a make over, but it wasn't to bad. Great take away fish and chips from the Kilhoan Hotel on Friday evenings. Easy access to ferry crossing to Mull. Lot's of things to see and do in the area if you aren't looking for a razz a ma tazz night life. Local shop for supplies Weather good have been better, but it didn't stop us from doing the things we wanted too. If they were visiting the area, yes. We have been to Kilhoan before and were already familiar with what was available. It is adequate. We felt that the chalet lacked the personal touch and some things needed attention - such as the guttering. As far as value went the basic price was OK but when you pay extra for most things such as linen, electricity and dogs it didn't seem value for money. I found it niggling that we paid extra to take dogs but we were asked to clean up after them ( we always do anyway) to make things easier for the cleaner so what was the charge for? I think the area needs to think about what it has to offer and make the most of it without spoiling the beauty.More lay-bys and better footpaths would have been helpful. Loos were lacking and the shop never seemed to have fresh fruit and veg or bread. Strathconan occupies a high position among a group of similar(ish) properties. Postcard views across Kilchoan bay, the Sound and to Mull itself at the front of the property and towards Ben Hiant and Meall an Tarmachain (I think) to the rear. There's parking for several vehicles yet it's only a short walk to the village. The property is about 20 years old and in places this shows a little. A rack to allow washing up to drain would be a useful addition to the otherwise ** very well-equipped kitchen **. There is no log-burner or open fire; instead plenty of electric heating is provided, hot water is electrically heated and the cooker / hob are also electric. 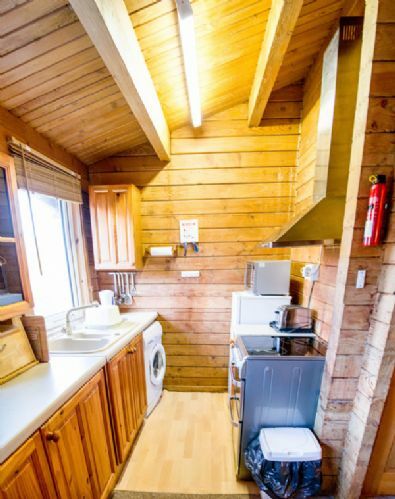 The kitchen also has a washing machine and separate tumble dryer. We hired bed-linen; beds were made for us on arrival - very nice and welcoming - and the beds themselves were in good condition and really comfy. Plenty of extra covers if you feel the cold although I didn't need any and slept with the windows open most of the time. 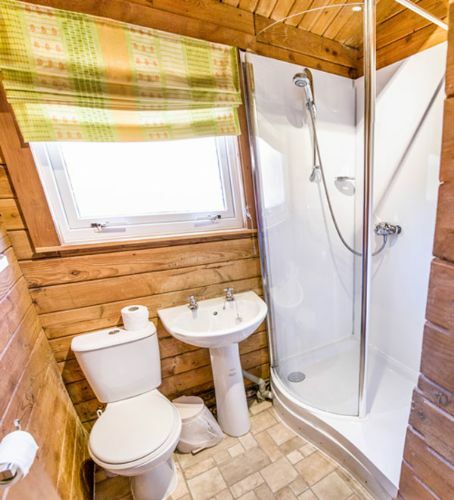 Bathroom looks to have been refitted fairly recently, shower worked well (nice to find as this is often a weak point in holiday homes!) and the living room furniture is solid and comfortable. All important entrance lobby to leave boots and to hang coats. A relaxing and lovely stay. Kilchoan is a small village and fairly remote yet I found the facilities on offer were excellent both in quality and range available. The ferry to Mull runs regularly and there are many walks, cycle rides and beaches to explore as well as boat trips if you want to go spotting things or fishing. Petrol and Diesel are available in the village along with a Post Office at the Ferry Stores, the Hotel offers good food and there are various other hotels, restaurants, shops, tearooms nearby. If you hop on the ferry to Mull, there is a wider range of facilities in Tobermory. We thoroughly enjoyed our stay in Strathconan. The location and views were breathtaking - watching the sunset from the cabin's porch is something we won't forget in a while. The cabin is comfortable and the open plan cooking/eating/living area adds to family time together. We came over on the last Corran ferry of the night which meant we didn't get there until around 10.30pm (in torrential rain)to find the cabin in darkness and no heating on. The property manager onsite was very helpful but, if we were to come again,I would reconfirm my arrival time. The location is beautiful the property could do with a log burner or central heating for the colder months. John and Jacqui are a lovely couple and the perfect hosts. Seven day stay over New Year. The cabin was very cold and extremely damp. No matter how much we heated and or ventilated the cabin it was always running with condensation. Our clothes had to be kept in air tight bags and condensation formed puddles on the shower room carpet. Sreadings have been recommended to all our friends and family. As expected. The level of facilities is what you would expect for this type of holiday. The house is located on top of a small hill and the view over the Water is wonderful. It is heated with elevtricity and it took us some time to get it warm. We enjoyed the distillery Ardnamurchan and the meal at the local Hotel. Excellent location with fantastic views. Comfortable well designed accommodation. The cottage is well positioned with wonderful views from the sitting room over the Sound of Mull. The kitchen/dining area/sitting room work well and the bedrooms were of a good size with adequate storage. The cottage is well placed in Kilchoan with a shop within walking distance and is well positioned to explore the beauty of Ardnamurchan. A friendly service was provided. A very enjoyable short holiday in a wonderfully scenic part of the UK. Good local facilities given the remoteness of the area. Our cabin was situated with stunning views to Mull. Very well stocked, we wanted for nothing. Quiet and relaxing, just what we needed! Fish and chips at local pub excellent, all the locals very friendly. Wildlife everywhere, including regular otter sightings on Kilchoan slipway. Storage radiators would be good to take advantage of off peak electricity-but that was only negative-we'd certainly come back!